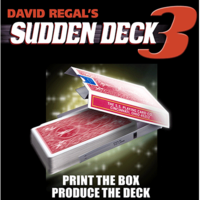 Today, when you order "Sudden Deck 3 by David Regal", you'll instantly be emailed a Penguin Magic gift certificate. You can spend it on anything you like at Penguin, just like cash. Just complete your order as normal, and within seconds you'll get an email with your gift certificate. SUDDEN DECK 3 combines ALL the features of the original Sudden Deck with the features of Sudden Deck 2. A blank unfolded card box visibly prints itself, then is folded into the shape of a box, and a regulation deck of cards is magically produced from it. This is a precision-made prop, and the perfect way to magically introduce a deck of cards. It's like carrying a stage illusion in your jacket pocket. For the first time with DVD instructions. This is going to be my new opener. Its just a great effect. Add to cart you won't be disappointed. I did it on my stage act and people are amazed.Plus you get 50 free disposable decks (also an amazing closer). So what I'm trying to say that if you don't get this I am going to come to your house and poop on your couch. I didn't get this trick from Penguin directly, but I thought it'd be appropriate to still write a review. I typically don't give out 5 stars unless something is REALLY good. I love the practicality of this effect! You can literally use this trick as an opener for any performance that uses cards. 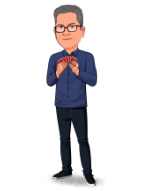 You can use your own cards, and the reactions that I get when I pull out a deck of cards, in the end, is just incredible. Everyone is shocked as I was when I saw the trailer. I'm really happy with the DVD, though. It goes so in detail about this trick and gives you everything you'll need to master this effect. Angles are pretty good as well, but you'll have to get good at it if you want to perform surrounded. The gimmick itself is made out of cardboard that looks like a playing card box, but it's much more sturdy and durable so that it can last longer. I HIGHLY recommend this trick, it is one of the best I have in my collection! Looks impossible and extremely practical. A great routine (or gag) that is highly visual and has a clear comedy potential! Use it as an MC or as an opener to your show... or why not as an interlude?! Packs small, PLAYS HUGE! David is a great inventor this is an upgrade on previous versions and is a wonderful. Definitely worth your consideration if you are after a great card trick opening effect. very inpresive if you doitright, well made, needs very litle practice and works like a charm, together with a disp deck is a great weapon, but the customers like the production of the deck alone it kills them.. I haven't had the best response from it but it does play well. After I make the card box I take out a deck called "White Bikes"
Now that brings the sudden deck into a perfect circle.